I LOVE, love, love your teacups! I adore that colour and your basket is so very pretty! I hope you do get to enjoy a tea picnic on Sunday. What fun! 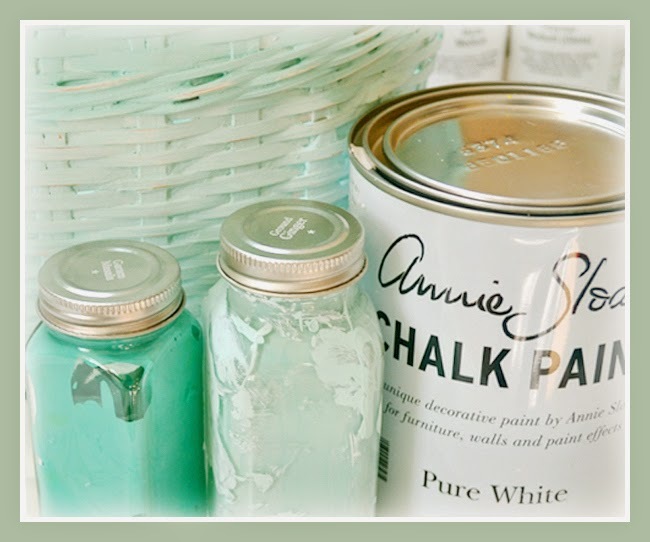 I haven't painted in a while but I've got two projects to do once the warm weather arrives and I can paint out on the deck. Thank you for sharing and coming to tea with me. Happy Easter, my friend! Terri, what a lovely project. I think the idea of an Easter picnic is wonderful. And you are doing a beautiful job of creating the basket and contents. Love it! Hey - you and me both! Sometimes I just can't "make it happen" as fast as I would like. I love your ideas here with the basket. What a great posting! I love the color of your Easter basket. 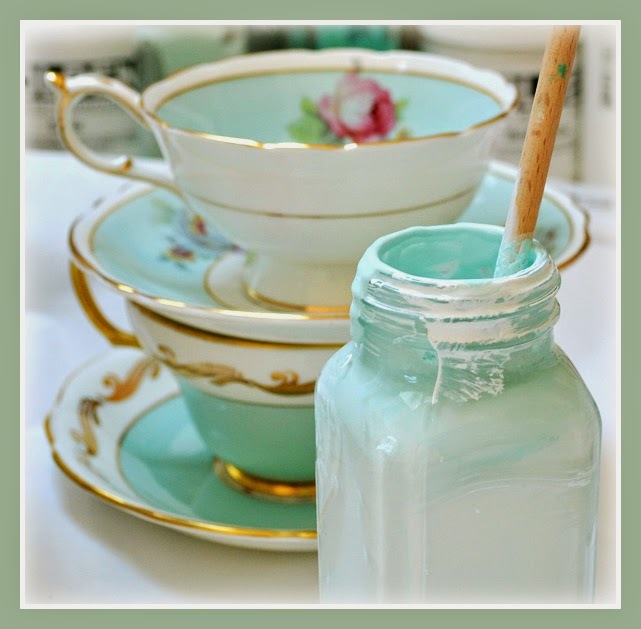 It looks great with your gorgeous teacups ... some of my favorite aqua and green colors. Spring! Happy Easter and Happy Tea Day. Thanks for hosting! A pleasing colour you painted the basket, perfect to hold the two coordinating teacups. I love the color of your teacups...sigh!! The project looks like a fun one and such pretty colors. Thanks for hosting and Happy Easter. this is so lovely! I love the teacups and the basket, they go so well together! I hope you will find a solution for your tea and I wish you a sunny easter picknick!! Brilliant idea. Love the idea of a picnic with those pretty cups. Have fun! that soft aqua-like color is so pretty! 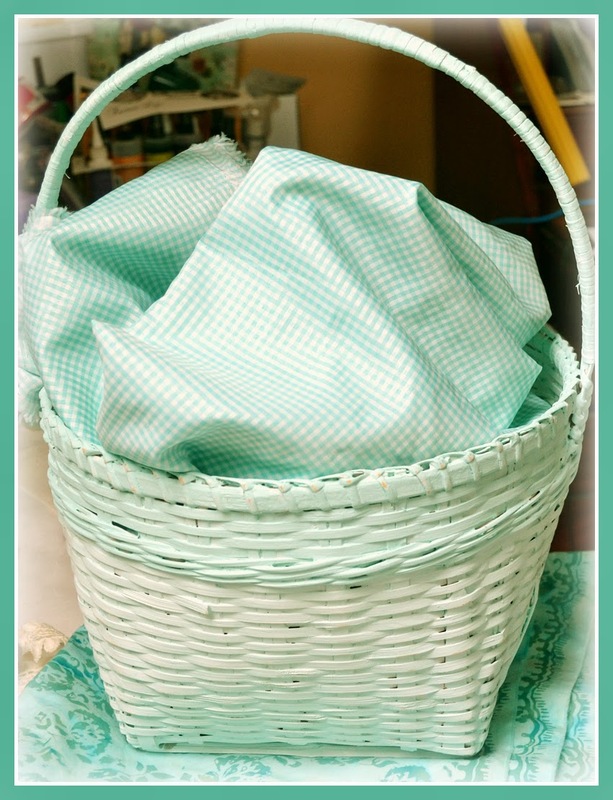 I love how you colored up the basket for the beautiful teacups and fabrics. I hope you have a perfectly warm, sunny day for your picnic! Hi Terri. Great project! Love the teacups. I just love robins egg blue colored sets. I only have a small individual tea thermos...really a travel bottle I use that I got from Murchie's Tea in Victoria, although I have seen others selling the same thing. Can't wait to see how your project turns out. Have a wonderful Easter! Happy Tuesday. I am in love with those gorgeous tea cups. Such soft colors. Your Easter basket is going to be stunning. Your basket turned out lovely, looks like it works with your teacups and material. I hope you have wonderful weather for your Easter picnic! I love the idea of having a picnic tea for Easter. The basket is so much better with the new aqua hue. The beautiful teacups and saucers color is just gorgeous with the fabric you have chosen, Have a wonderful Easter! 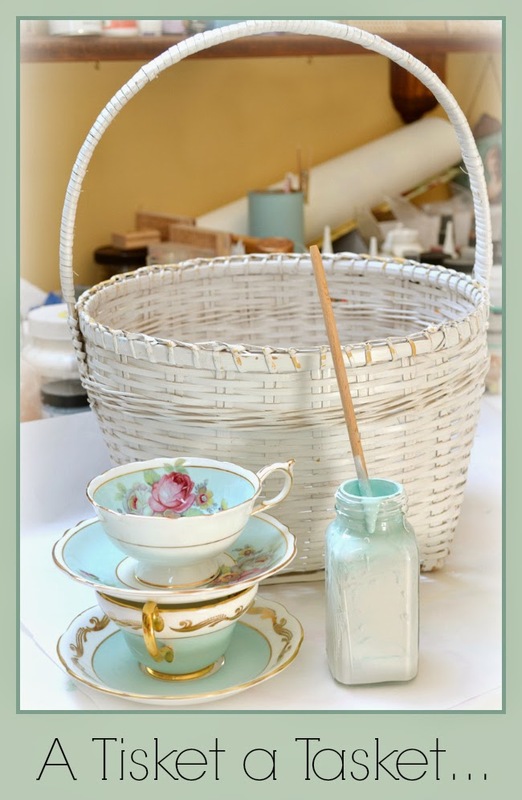 The colors of your teacups, paints, fabrics, and baskets are so pretty and dreamy I am swooning! I am overjoyed with your newfound energy and joy and hopeful for your Sunday tea! Love you friend! Oh your basket is sweet in your favorite colors Terri to match those glorious cups and saucers. You know Jeff has been taking the same stainless steel thermos to work for about the past 30 years. It is an Aladdin Stanley made in Nashville, Tennesse - would you believe! It still keeps the water perfectly hot just as it did when he first bought it. It must be the most robust thermos in the whole workd -hehehe! I really hope you have a beautiful sunny day for that picnic on Sunday when I will be thinking of you! I have that top teacup! What a wonderful idea. Thanks for sharing! 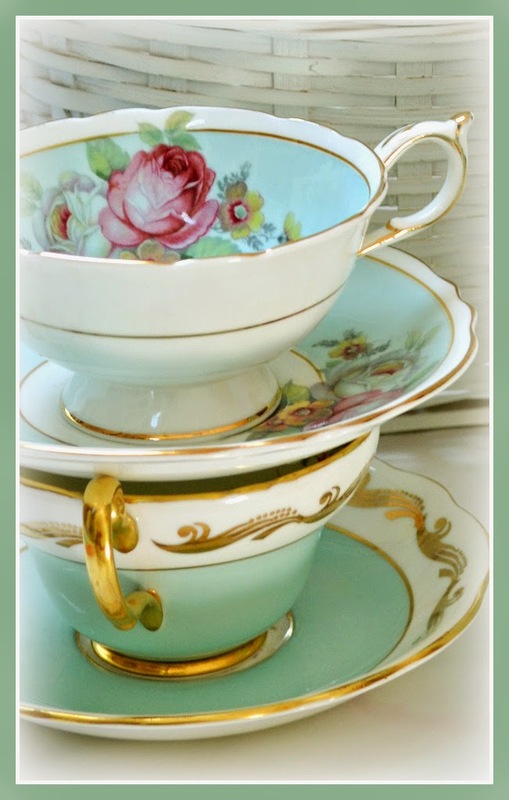 Beautiful teacups--I love that color! 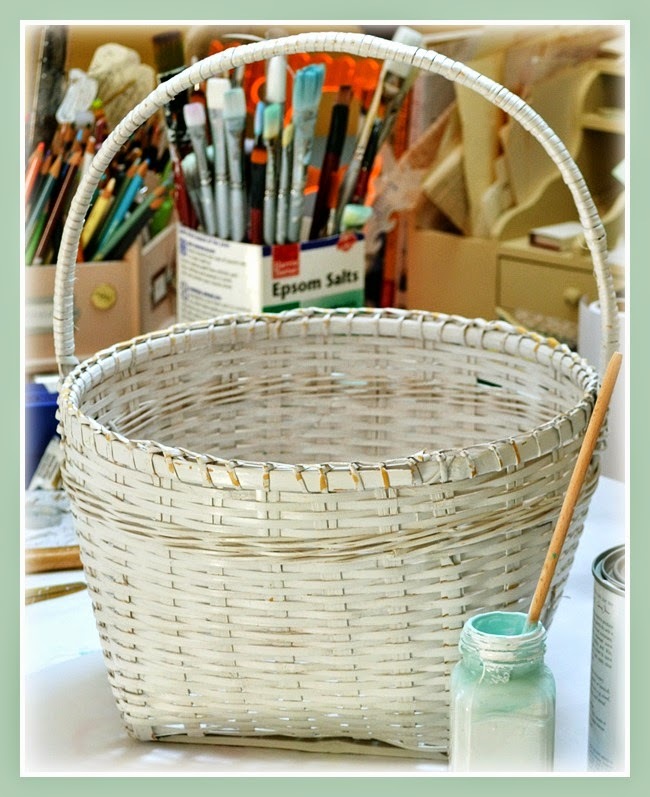 That is such a clever idea to paint a basket to match the loveliness :). Happy Easter! thats a lovely idea to paint the basket and make pads for the china inside. This will turn out wonderful. The right picnic basket to use it with Bertha. I am so curious how it will look when ready. I am sure it will be the pure delight. Just the color is a delight for me. I have no idea for a nice thermos jug, alas. I wish you a blessed Easter. Thank you for sharing this and for hosting this sweet event. 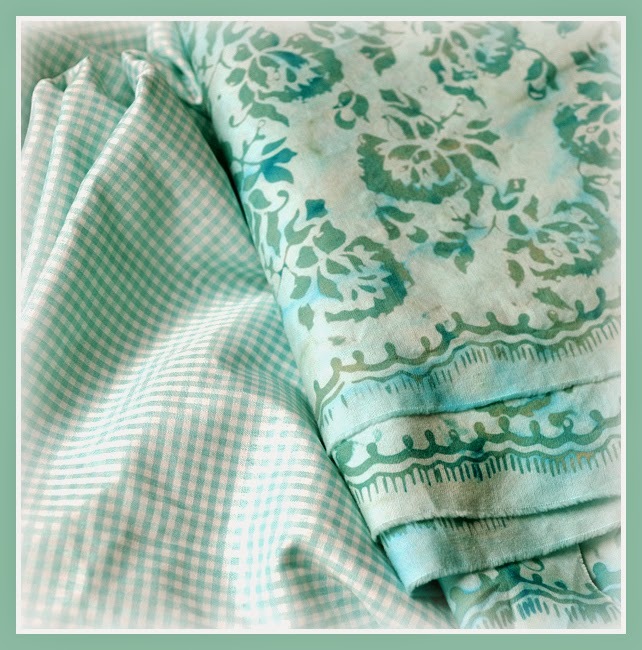 Hi Terri....Beautiful and magical...how delightful..love your photos and imagery..inspiring..and yay..one of my fave color palettes..I can never get enough of the turquoises-aquamarine hues.. Thanks for sharing your gorgeous project..stunning! !